And the 88 rating he carried from France was a joke. Absolutely. He performed well in G2 races in Europe so why was he rated so low? Confirmed going Kingstown Town then Metrop. If he wins Metrop then Caulfield Cup. Well that is my Melbourne Cup bet out. If they think he is a wfa horse for next year, he pulls up stumps after Caulfield. 54 kgs for The Metropolitan. 4 over the limit and 4 under the top weight. Will go up ~1kg after winning the Kingston Town Stakes this week though. Massive today. Going to be hard to beat in the Caulfield Cup. The sectionals will be interesting for this race. He got back on the rail ( ) and somehow the heavens opened up for him in the straight and he gave them no hope. Metrop next and if he goes as well in Melbourne the Caul Cup is not beyond him. I hope he does stay in Sydney for the Metropolitan Hcp. But James Cummings just surprisingly mentioned the Bart Cummings Stks at Flemington as another option. I wouldn’t be suprised if Goldolphin totally deviate from the original target race. Who knows, he might end up in a Turnbull Stks!! Does it get him into the Melbourne Cup without a penalty ? I know it is a ballot free race for the Cup. The Turnbull Stks is penalty free & ballot free for the Melb Cup. Whereas if he happened to win both the Metropolitan & Caulfield Cup double, he’s likely attract weight penalties of 1kg & 2kg respectively. That would take his Melb Cup weight from current 53kg up to a heftier 56kg. Lol. The Turnbull Stakes is also the target of a pony called Winx. He might be flying, have untapped potential etc but they wont pin their hopes of him getting entry to a target race by beating Winx. 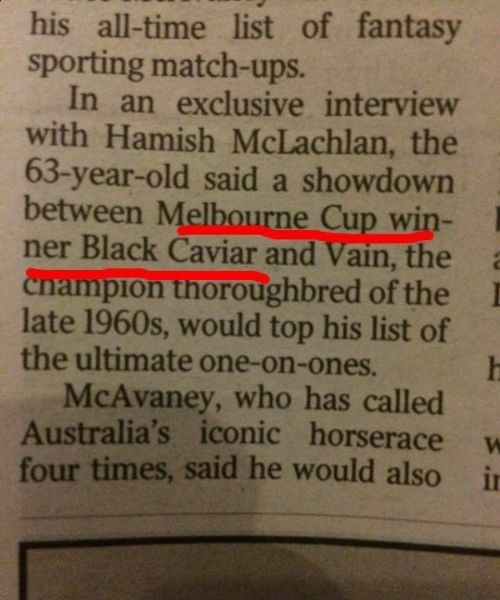 If you've won the Metropolitan and Caulfield Cup who cares! He would've earnt the weight anyway. Exactly. Has the metrop at his mercy should just go there then caulfield cup. Beadman has suggested that the metrop will be his next race this morning due to the 54kg without penalty. Apparently out of the Metro. Got too much money has the blue team , they have foresaken the substance for the shadow, would have won the Metrop. on his ear and guaranteed a MC start imo, the last 67 Metrop. winners and placegetters are riddled with MC winners, now down the h/way reverse way form for the BC will come from all angles seeking a start as well, not the first time they pulled the wrong reign imo Hartnell in the Cox P. as against the CC, on Saturday with Kementari they knew the weather was going to be filthy and the WFA very strong so they ignored the weaker Sydney WFA , good weather and taking out the champ they could have run Second ( giving him an easy time) dropping 3kg in 14 days for an Epsom run even though D'Argent is weighted to win, nothing's guaranteed , however this is Avilious's thread , a future topliner and a Melbourne Cup is not beyond him where ever he goes. Disatrous move. Will have trained off by then imo. Wont be winning any Group 1s. And I might add I feel for the punters who took this horse in Multies and pre-post metrop.betting, dudded again ! Led to believe the winners of the following races are ballot exempt for the Caulfield Cup, irrespective of allotted weight. Makybe Diva Stakes (1600m), Dato’Tan Chin Nam Stakes 1600m, Underwood Stakes 1800m , Naturalism Stakes (2000m) ,Turnbull Stakes (2000m), Herbert Power Stakes (2400m), Caulfield Stakes (2000m), and Mornington Cup (already run). Reckon he'll be down in Vic earlier rather than later. You got that he would in Melbourne part bit right. Almost not to mention getting the "earlier" bit right also. The only thing I can think of is that they didn't want to get penalised for a Metrop win going into the Caulfield Cup and also get penalised for the Caulfield Cup (should they win it) going into the Melbourne Cup. It makes more sense to guarantee a start in the MC by winning the Bart Cummings (which I assume doesn't carry a weight penalty), then rolling the dice in the CC where the horse will be penalised for the Melbourne Cup if it won, but that is a good 5 million dollar problem to have. And it would only result in one penalty. The Metrop. field is very ordinary imo this year and I doubt very much had he won with 54kg the handicapper would give it much significance even though he has 53kg in the CC, what I'm trying to say is this, the Bart Cummings will have plenty of o/s form from all over the place and he could bump into a real rod in the pickle if you get my drift, wins the Metrop.all problems eliminated imo.